Welcome to The Big Apple, the world's biggest apple where our homemade apple pies and apple bread are made and baked right in front of you! Under the new ownership, significant renovations have been done throughout at The Big Apple to create a warm country welcome. Watch us making your favourite apple pie, enjoy lunch in our cafeteria-style restaurant or pick up that special souvenir for home. There is something for everyone! The Big Apple hosts more than 500,000 people each year, offering fun for all! All outdoor activities are complementary such as Mini Putt, shuffleboard, bocce ball, ping pong and our popular kid's train ride. We are conveniently located just two minutes off Hwy 401, at exit 497 in Colborne Ontario. 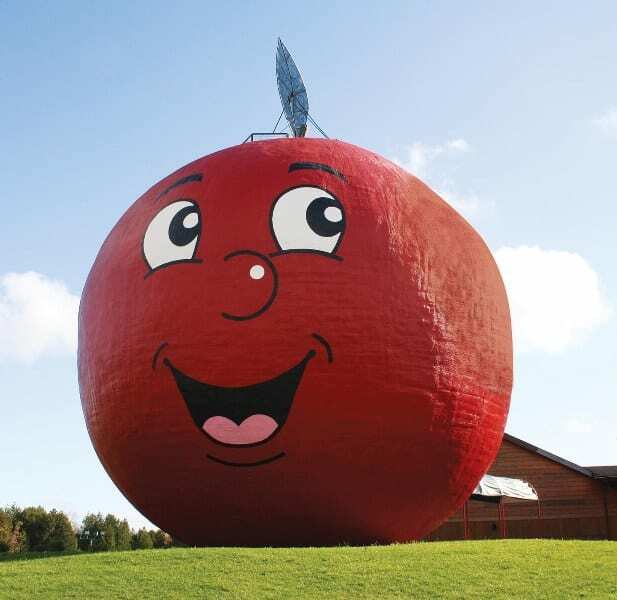 Being the world's largest apple-shaped structure, you'll be sure to see us! Plenty of parking for all! Bus tours are welcome. The Big Apple is pleased to offer a diverse and growing selection of gluten-free products including our own made-on-site pies and granola, and breads & cookies from the nearby Ste. Anne's Bakery. As the home of our delicious apple pies, bread and other apple-inspired goodies, this is where it all begins! Our Apple Pies and Apple Bread are pretty famous, but we also make an awesome Pecan Pie and a Mumble Crumble Bread. This yummy loaf is larger than our regular Apple Bread and contains raisins and our signature mumble crumble topping! It's not just pies and bread we make either - our saucy apple dumplings are regularly sought after. We have apple crisps and apple bread puddings in two sizes! Our own Apple Bites (croutons) are available in two flavours - butter or sugar-cinnamon- they make an excellent snack or salad companion. Newest additions include 'Pie in a cake' and 'Tart in a muffin'. Come and tempt your taste buds - there's sure to be something to suit everyone's taste at The Big Apple!